Net Impact is your resource to explore impact careers to find the path that is right for you, but we don’t stop there. 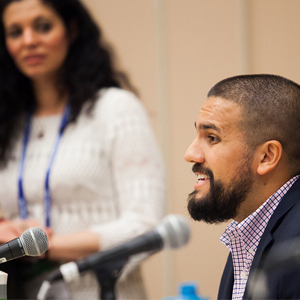 We know that any job can be impactful and NI17 will support you in finding your career with purpose - whether that be with a nonprofit, corporation, social enterprise, or incorporating impact into your current job title. If you are currently in the job market, you can’t miss the NI17 Expo. The Expo is a gathering of leaders from international corporations, social enterprises, and nonprofits. 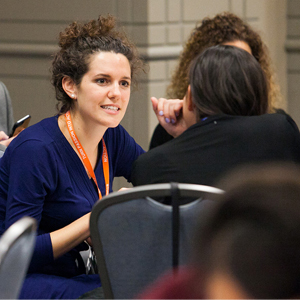 Network with professionals, showcase your skills, and learn the progress these organizations are making, all to help you design your own impact career path. We will even have recruiters on-site. We have numerous mentoring opportunities including small group mentoring and one-on-one career coaching. You can also join Vice President for Corporate Social Responsibility (CSR) and Sustainability and Campbell's Soup Company, Dave Stangis for a special session titled Beers & Careers. These exclusive opportunities will give you direct contact with an impact business leader to design your career track. Many of these special career resources and tools require reservations and have a limited number of seats so register for the Conference and reserve your spot today. In this interactive boot camp, you will do a deep dive into what it takes to find and land your impact dream job. Career experts will help participants understand the broad range of purpose-driven career paths highlighting key skills and providing concrete tips for building a network, creating a strong resume, and leveraging social media for your career. If you already have a job, there are ways to incorporate impact into your career. This panel will pull together individuals who have committed their careers to purpose across different sectors and industries. They will share how they got there, and you will leave inspired to bring purpose into your day-to-day work, no matter which path you take. We will also have professionals-only opportunities including a Professionals Corner, exclusive workshops and boot camps, and a reception at the Georgia Aquairum. Enhance your impact career by registering for the 2017 Net Impact Conference today - hurry prices increase on October 18! It is great opportunity for job seeker to design their own impact career path, showcase their skills, and learn the progress of organizations via the NI17 Expo which is a congregation of leaders from worldwide companies, social enterprises, and nonprofits. It is also best guidance for those students who have been taking UCAS medicine personal statement examples from Personal statement Folks and soon be graduate. So this blog is provide them right career path and frequent mentoring opportunities together with small group mentoring and one-on-one career coaching.